The Pulaski Yankees are excited to introduce the Community Organization of the Night presented by the Pulaski County Chamber of Commerce for the 2019 season. Through this program, the Yankees will highlight one area non-profit organization at each home game during the season. The organization will have the opportunity to set up a table on the concourse at Motor Mile Field at Calfee Park, be shown on the jumbotron during the game, and welcomed with a PA announcement. To be the Community Organization of the Night presented by the Pulaski County Chamber of Commerce, organizations must be a registered 501(c)(3) non-profit located in Pulaski County or a surrounding area. Organizations must purchase a minimum of 20 group tickets for the game - a $100 investment that helps increase your group's presence at the ballpark on the night of which you are the Community Organization of the Night. At the end of the season, the organization that sold the most group tickets will receive a $400 cash donation from the Pulaski Yankees and the Community Organization of the Night program presented by the Pulaski County Chamber of Commerce. Space for this program is limited to 34 non-profit organizations (one per game) and requests are accommodated on a first come, first serve basis. If your organization is interested in being the Community Organization of the Night presented by the Pulaski County Chamber of Commerce, please contact James Cahilellis at jcahilellis@pulaskiyankees.net. The Pulaski Yankees are proud to represent the town of Pulaski and be a member of such a great community. The front office staff, players, and coaches enjoy opportunities to give back to the community that helps them be successful on the field and at the ballpark. 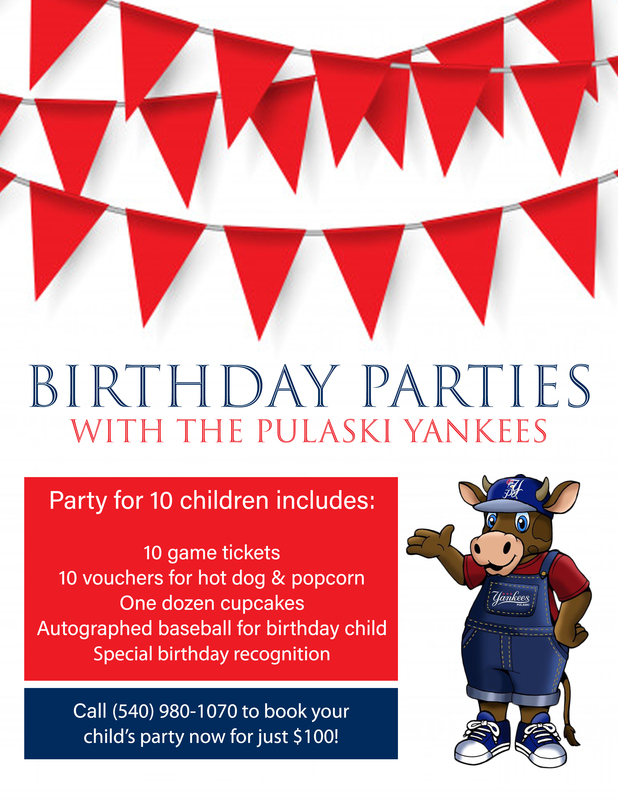 If you would like Calf-E (the Pulaski Yankees mascot) to attend your community event, please email bhaugh@pulaskiyankees.net. Please note: player and mascot appearances are limited during the season, but we will do our best to accomodate requests. Minor League Baseball and its clubs celebrate a long history of supporting charitable organizations. Collectively, Minor League Baseball teams and leagues donate more than $30 million annually in cash and gifts-in-kind to local charitable organizations and national charity partners. Support and participation in charitable endeavors has helped Minor League Baseball and its clubs to establish a strong presence and active role in communities across the United States and Canada. In addition to extensive local support by Minor League Baseball teams, two national initiatives help extend our reach. Stars & Stripes Caps with New Era Cap Co.
For more information about Minor League Baseball's community involvement and MiLB Charities, click here.